Are people asking you for your speaker sheet? Do meeting planners pass you by? Speakers, Coaches, Authors and Business Leaders miss opportunities every day to get on stage to share their message. a professional Speaker Sheet that gets attention! customized for you and we offer three types that will delvier exactly what people are looking for to book you! As a public speaker on the rise, your One Page Speaker Sheet showcases your signature speech to INSPIRE the event planner to book you for their event. The One Page Speaker Sheet also works as an addendum to a speaker’s portfolio by highlighting a message that differs from the speaker’s primary platform or a speech geared to a different audience. 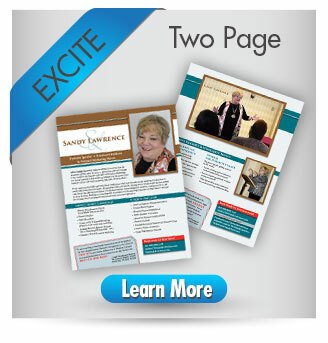 A Two Page Speaker Sheet is sure to EXCITE the event planner with your value as a speaker. Powerful imagery and professional design techniques gives you credibility as a leader and authority in your field. The Two Page Speaker is Sheet is the perfect size to showcase your speech titles and testimonials of your presentations to demonstrate how you truly WOW the audience. WOW! event planners with a Four Page Speaker Sheet showcasing not only your value as a speaker but the accomplishments you have made along the way that make you an expert in the industry. 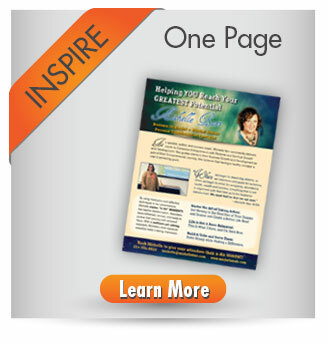 The Four Page Speaker Sheet allows you to provide more information thus giving conference decision makers options on how to best utilize your time and talents to EXCITE the audience. Inspirational Speaker, Motivational Speaker, Corporate Trainer, Thought Leader, and Industry Authority.